Did you know that some Florenza designs were always unsigned? While some jewelry pieces manufactured by Dan Kasoff Inc., commonly referred to by the company�s trademark name �Florenza�, can be found in both signed and unsigned versions, these typically fall into one of three categories. A few of these items without marks are pieces that were the very first made in that design. They were used as salesman samples and as reference pieces in the factory. Other examples of unsigned Florenza are those that are part of design groups where some pieces were marked and others were not. Typically, the unmarked pieces in this situation are earrings, but not always; I have some examples where a bracelet is marked and a necklace in the same design is unmarked. Though rare to find, some identifiable unsigned Dan Kasoff Inc. pieces are those produced in the early 1950�s, before the company started to use the Florenza trademark. The examples that are the subject of today�s topic are those items that do not fall into any of these three categories, but nonetheless are always found without a mark. Over the years, I have discovered many such designs and wanted to share two of them with you. In the photo, you�ll first see a bracelet and earrings that are set with amethyst-colored comma or crescent-moon-shaped stones. Not only is this particular design always found unsigned, but it also was manufactured unsigned in a second color scheme using green comma stones and gold-tone plating. The second example in the photo is a matching bracelet and earrings set with large eight-sided octagonal stones. As with the first example, this design appears in different color versions including white and pink stones set in gold-tone metal. Again, in my experience seeing dozens of pieces in this design over the years, they are always unmarked. 1) The stones are set in what is referred to as �Tiffany-style� meaning that there are multiple faux prongs surrounding many of the rhinestones. 2) The texturing found on the back of the pieces is typical of Florenza designs and the same texturing can be found on signed Florenza pieces. 3) The way in which the bracelet links connect is typical and again found on signed pieces. 4) The same clasps and earring clips are found on many signed pieces. 5) The color schemes are typical of signed Florenza pieces. 6) The octagon stones in other colors such as olive-green and turquoise-blue were used in several signed Florenza design groups. The first five identifying factors mentioned above are present on both of these unsigned designs. When considering whether or not a piece is unsigned Florenza, you should always look for several typical traits, not just one or two. 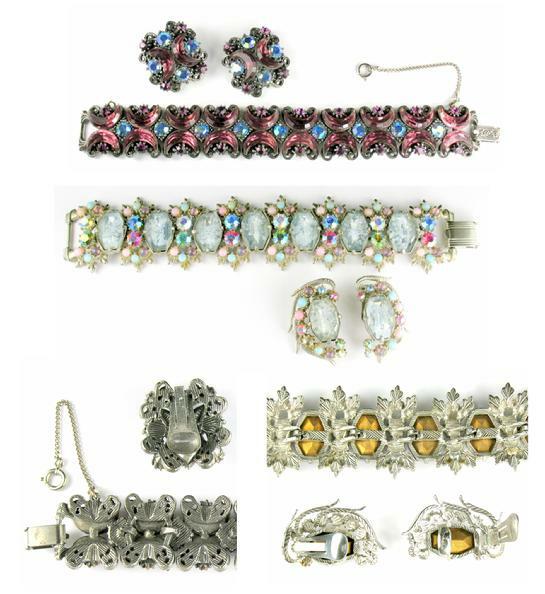 Many vintage costume jewelry manufacturers used �Tiffany-style� stone settings or similar back texturing or connectors, the same clasps and earrings clips, and the same color schemes. But all of these factors seen in a single design provide a fairly certain identification. Also, the lack of any features that were never known to be used for Florenza designs reinforces the correct conclusion. I�ve listed just six identifying factors above, but there are many more common Florenza jewelry traits that can assist with the identification of unsigned pieces. The remaining question is: Why were these particular designs always produced without the Florenza mark? It�s an important question because Dan Kasoff Inc. added the Florenza signature to nearly every item that they produced beginning in the mid-1950�s and thereafter. I believe that the only reasonable theory is that these pieces were manufactured for a single buyer and were exclusive to them. That buyer might have wanted unsigned pieces for re-sale that they could brand with their name by adding a paper hang tag or specialty packaging. Because many of these unsigned pieces appear today in fairly large numbers, production must have been close to that typical for signed Florenza designs. Hence, I would also say that the single buyer was probably a wholesale distributor that sold to many retailers. But, it is also conceivable that a very large retailer such as a department store chain or nationally-distributed catalog mail order company might have ordered large quantities of an exclusive design. That�s not to say that all of the known unsigned pieces in every design went to the same single buyer, but rather that one or more single buyers had certain unsigned pieces made exclusively for them. Unfortunately, we�re unlikely to be able to identify the wholesaler buyers of these unsigned items, though I do keep an eye out for any vintage print advertisements which might show the pieces and identify one or more of the retailers. Unsigned Florenza jewelry carries a higher value in the marketplace than that of similar-quality signed Florenza pieces, and it is highly-coveted by collectors. However, by virtue of the fact that they are unsigned, a savvy shopper can many times pick up a bargain if a piece is not known by the seller to be a Florenza design. But do be cautious; for every actual unsigned Florenza piece on the market, there are dozens more misidentified as being made by Dan Kasoff Inc. Wishing you Happy Hunting for unsigned Florenza!